Worrying about your lost/stolen mobile phone? Do you fear violation of you valuable data? Are you wondering how to catch the culprit? 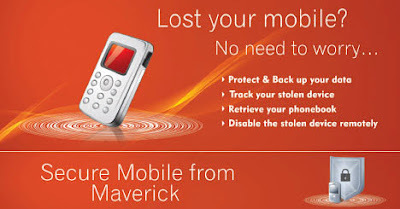 Then you have to know about this wonderful Anti-theft software for mobile phones named Maverick Secure Mobile (MSM). In case of a theft or accidental loss, Maverick Secure Mobile (MSM) software protects the valuable data by sending it securely to a predefined mobile number selected by the user. Also you can track your mobile, retrieve your phone-book and can protect your mobile by disabling the stolen device completely and thus making the culprit never use the device he has stolen even after inserting a new SIM. So in brief, it not only secures the device but also the data as well. During the installation of this application it asks for a reporting mobile number which can be your second number, your spouse’s or friends number or any other mobile number on which you want to receive all the reports. Once installed the application works in a hidden mode and cannot be seen in the phone. To launch and customize this application you have to press predefined short keys just as username and a password. The predefined number given by the owner of the device is used to perform the following activities on the stolen mobile to humiliate the thief of your mobile device. It has the specialty of making a spy call to the stolen mobile from the reporting device which activates loud speaker and mike without any ringtone or alarm set and the thief can’t know about this spying being done on him and he cannot stop the spy call either even if he does manage to know. When the thief changes the SIM card the entire data on the device will be encrypted so that the thief will not be able to access or view any data thus assuring the privacy and security of your valuable personal data. Moreover after insertion of a new SIM it sends an SMS to the reporting mobile with details including thief’s new mobile number, device id, country id, country code, operator name, area code etc, which facilitates in tracking him easily. All the activities and transactions that are done on the stolen device including outgoing calls, incoming calls, SMS, MMS etc., along with phone numbers will be sent to the reporting mobile number via SMS/MMS. For example, if a call is made from the stolen device, it automatically sends an SMS to the reporting device with details such as Number Dialled, Call Duration etc. Besides this all the call logs and the messaging history including the entire messaging text is sent to the reporting device by SMS. To retrieve your entire phone-book all you have to do is to send an SMS as “Contact=all” (without quotes) from the reporting device to the stolen device which starts sending all the contacts from the stolen device to the reporting device. All this is done in hidden mode so the thief cannot know that the contacts are being sent. To make the life of the thief more miserable all you have to do is to send an SMS as “Hang” (without quotes) from the reporting device which raises a loud alarm by playing a blaring siren displaying a customized message in which you can add your name, alternate contact number, contact address, award amount etc, in case if he changes his heart and feels like returning your mobile. This unique SMS sent from the reporting device to the stolen device actually disables the device completely locking all the features on the mobile including keypad. This means that the thief cannot switch off the mobile device either to stop the annoyingly loud siren. The only possibility to deactivate the alarm is to remove the battery but as soon as he inserts the battery again the siren is reactivated. So there is no way he can make use of the device he has stolen. All he can do is either throw it away or give it back and take his award amount. The latter option would be better. All the features of this application can be used with your original SIM in place also , this can be done just by sending and SMS as “Active” (of course without quotes) from the reporting to stolen device to activate the features. Parents can use this application to keep an eye on their child’s mobile by tracking its activity if needed by sending an SMS as “Track” from the reporting device. As you will be the one who has installed the application and set the password your child cannot know that they are under tracking because as said earlier this application runs in the hidden mode without any notifications. Although the product is in beta, it has already made a deal with Nokia to begin distributing this anti-theft application on Nokia phones. First validate your device and then buy MSM software. It costs 69$ per year. this is a big help to all mobile phone users. Lost this Mobile no: 9640740885<br />SIM No: 89910704350008228506<br />IMEI: 351993049646384<br /><br />Any help..